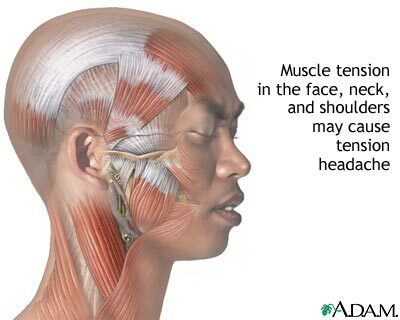 Image of muscles invloved with tension headaches. Tension headaches for many of us have become an all to frequent occurrence. You can’t mistake that horrible feeling of pressure building up behind your eyes, the tightening of your neck muscles, then the dull ache that follows it. For some of us these headaches can range from being mildly annoying to causing pain that can last for days. Tension headaches can be caused by many things: from spending too much time in front of a computer screen, a build up of stress from a bad day or even grinding your teeth & clenching your jaw. The main cause of this issue is usually muscle contraction and limited blood flow. This is where the Indian Head Massage comes in, instead of reaching for the pain killers for a quick fix, why not take the steps to prevent further tension headaches from arising. At Happy Lotus I see many clients that suffer with tension headaches,and through regular massage of the shoulder, neck head and face muscles, the pain and tension are eased away. Indian Head Massage works at warming the tissues in these areas to relax tense and contracted muscles reducing pain and fatigue. It improves circulation bringing fresh nutrients and oxygen to cells. It also helps to stimulate endorphins the feel good hormones that lift your mood. If you are suffering with tension headaches or wish to prevent them occurring please contact me to experience your own Indian Head Massage and feel the powerful benefits. For more information on Indian Head Massage or to Contact Me click the links.